← NGSS as Maine’s Science Standards? It’s Not So Simple. It would be great if students had a chance to do science that matters. It would be great if students had first-hand experience with the work and concerns of their communities. It would be great if we didn’t lose so many clams to green crabs and if we could return clam flats to something like their former productivity. Maybe we can put those three ideas together. This is the first of what will be many stories that emerge as students from Sumner Memorial High School (SMHS) in Sullivan, Maine work with adults from state and local agencies and from the Schoodic Institute, where I work, to get a better understanding of where softshell clams grow best and how to protect them from getting eaten by crabs and other predators. Since this is the first post, I should provide some background before launching into the full story. But … before I get into the background, I want to share a few “motivational” pictures from work that the students were doing on a Thursday morning a few weeks ago, in October. I say “motivational” because I want you to see why this work is exciting and important. 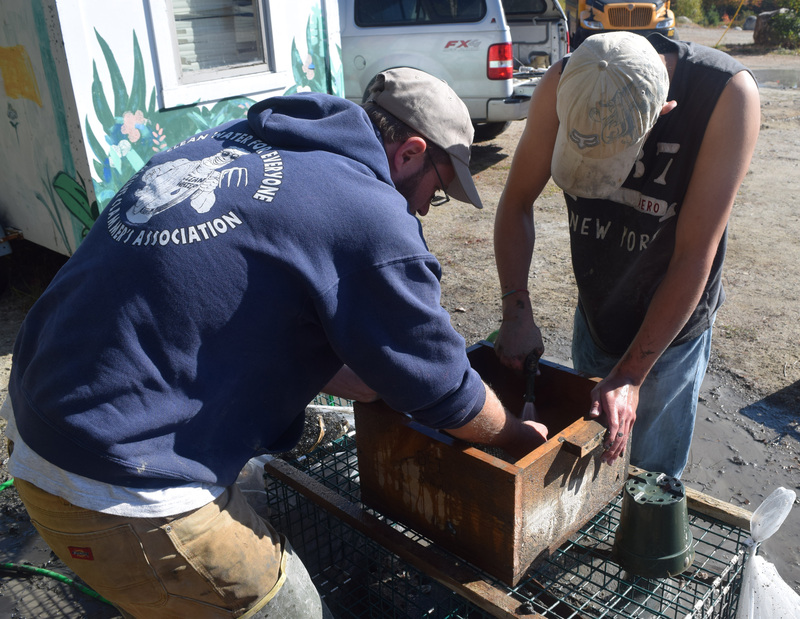 In this picture, students are washing off the mud that was in 6-inch plastic flower pots that Downeast Institute (DEI) researcher Kyle Pepperman placed out in clam flats in Steuben and Gouldsboro last spring. He put 12 juvenile clams grown in the DEI hatchery in each pot and, before setting the pots into the mud, covered each one with a mesh net to keep green crabs from getting in. After Kyle dug each pot up, he placed it in a plastic grocery bag, complete with mud, clams, and anything else that crawled in. There were 15 of these pots at each of four sites; the students’ job was to wash the mud off of the contents of each of the 60 pots to find out what was inside now, a half year after it had been placed out on the clam flat. Here is another picture of the washing and counting operation. Kyle is on the left, working with a student. You can see the plastic flower pot sitting to the side on the lobster crate. Did all 12 clams survive? If so, how much did they grow? If not, what happened to them? Did other, wild “seed” clams (they are VERY small as they drift around in currents before settling into the mud) settle into the pot and begin to grow? Above is a picture of a hatchery clam from one of the pots. 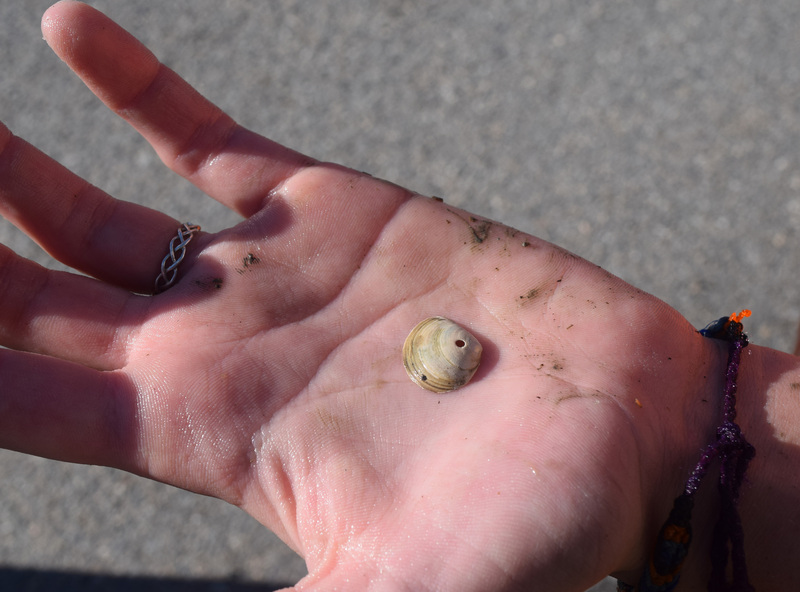 Notice the change in the coloration of the shell at the tip of Kyle’s finger. 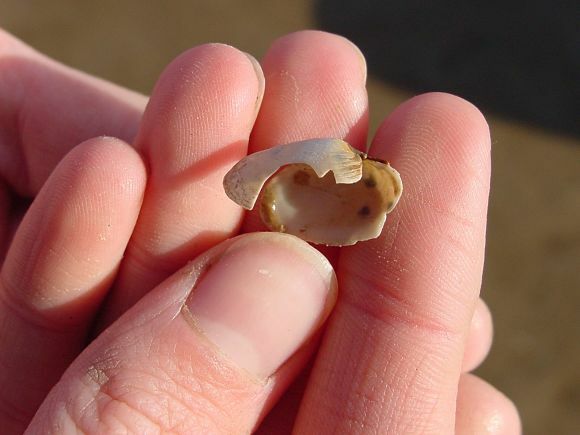 That line, called the “hatchery mark,” appears on all hatchery clams that survive and grow after being placed in the mud. It occurs naturally as a result of the change from the hatchery conditions to the conditions on clam flats. It does not occur on wild clams, which makes it easy to distinguish clams that were seeded from those that settled naturally. It also provides a way to see how much the hatchery clams grew. As you can see, this one grew a lot. There are many animals other than people that eat clams. Above is a picture of the shell of a clam that was probably a meal for a moon snail. A moon snail can use the sharp teeth at the tip of its radula (sort of like a tongue) to drill a hole in the clam’s shell. It then injects digestive enzymes to dissolve the clam tissues within the shell. As Kyle put it, the snail then has a clam milkshake. The students also found evidence that crabs had been able to get at some of the clams, despite the netting. Below is a picture from the DEI website of a crab’s work on a clam shell. After the students washed off the mud and retrieved the live clams and evidence of what happened to the dead ones, the shells and other evidence from each pot were sealed in a plastic bag that Kyle put into a freezer. Later this fall, students will work through each bag, tallying what were live clams, clams that were dead when collected, and wild recruits. They will measure clam growth and record information about predation. 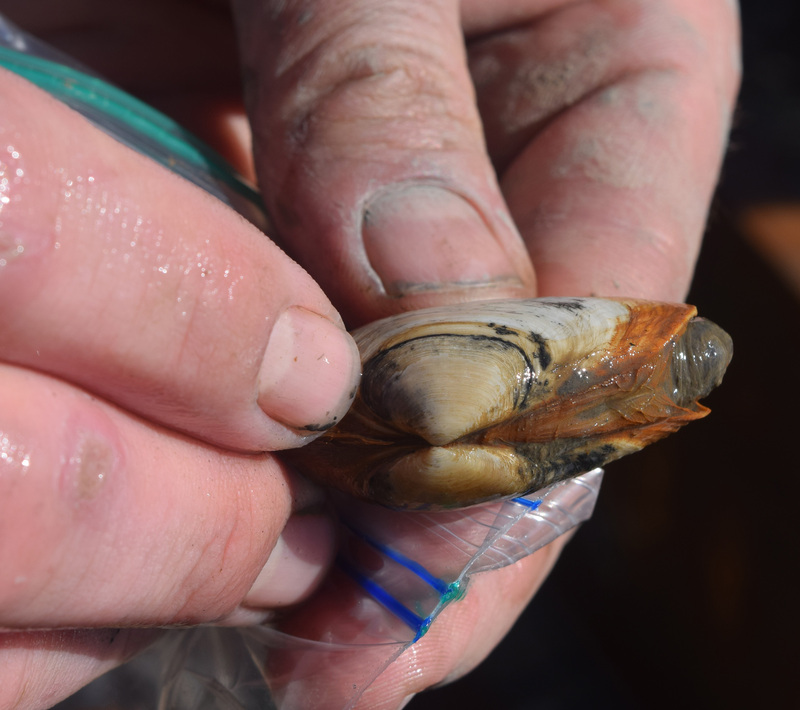 Taken together, these data will help shellfish committees in Gouldsboro and Steuben make decisions about which locations are likely to be good places to put thousands of hatchery clams next year. The data will also provide information about locations where there was a good amount of wild clam settlement. In Maine, responsibility for managing soft-shell clam resources is divided between towns and the State. The State has responsibility for ensuring that clams are safe to eat, so the Maine Department of Marine Resources (DMR) monitors water quality and tests for the presence of paralytic shellfish poison (“red tide”) and other risks to human health. The towns have the option of regulating and managing their clam flats. They can restrict the number of commercial clam licenses, restrict the number of non-resident diggers, and close flats for reseeding and other conservation purposes, among other things. 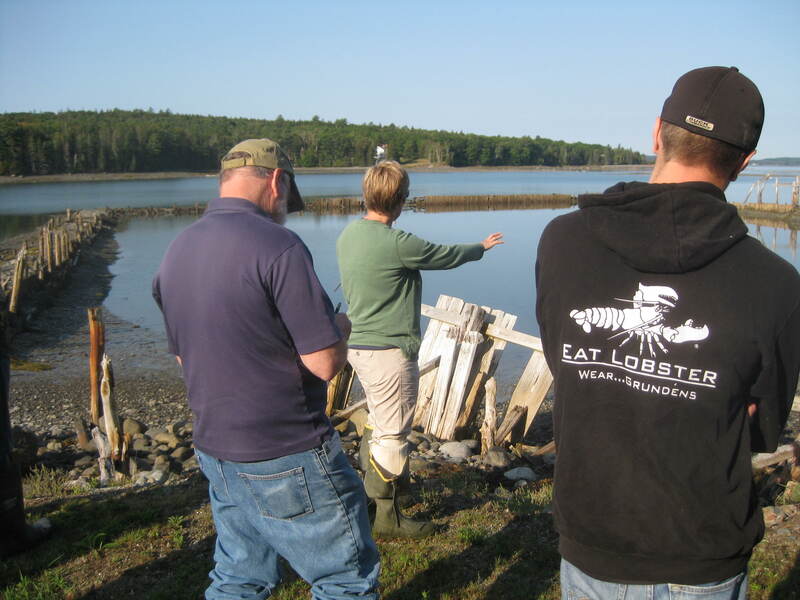 Steuben and Gouldsboro are among a dozen or so other towns that have emerged as innovators in managing their clam flats. They close flats so that they can recover after harvesting, stock flats with seed clams, and place nets over newly stocked sites to minimize crab predation. Clam management and conservation require both time and knowledge. It takes time to set out and retrieve nets over seeded clams and time to conduct clam population surveys to aid in deciding which sites are most productive. It takes even more time to design and implement the kinds of experiments that the students are doing with Kyle and the DEI to learn more about wild clam settlement and the rate of clam growth at different sites in a town. These kinds of experiments also require know-how to design the study, implement it, analyze results, and reason about what the results mean. 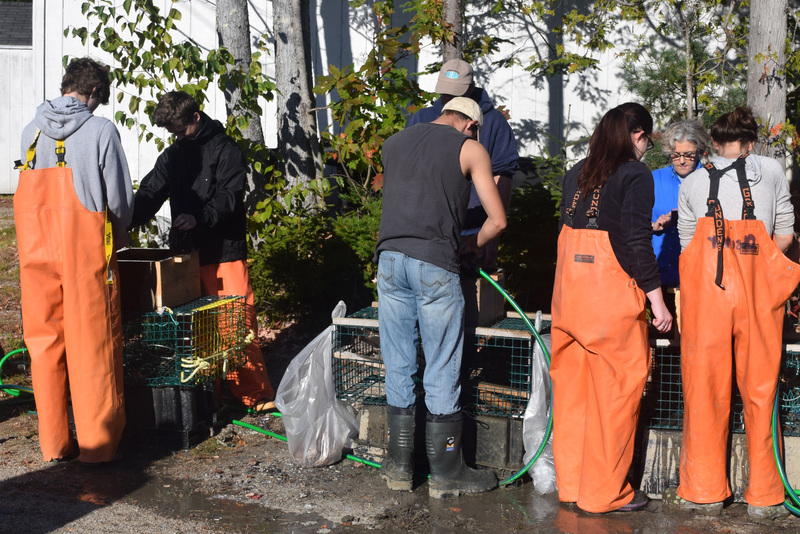 As the students and teachers work with Kyle, with Heidi Leighton, the regional DMR biologist, and with Mike Pinkham, the Gouldsboro and Steuben shellfish warden, their many hands are not only helping with the “time” problem, but they also learn how to contribute the know-how. Just as important, they get involved in thinking about the place where they live. Working side by side with adults who live here and do interesting work here, the students are involved in the details of sustaining the living systems around them. This summer, as Schoodic Institute, SMHS, the town shellfish committees, the DMR, and the Downeast Institute began thinking and talking about how students and teachers might be able to improve towns’ ability to manage clam resources, we realized that we could expand beyond what the towns were already doing to take on a big, new project. Shellfish warden Mike Pinkham and DMR scientist Heidi Leighton had, for some time, been thinking about how they might be able to convert an abandoned lobster pound in Gouldsboro into a research site that would allow them to get a better understanding of crab population dynamics and of clam growth. The problem, as always, was one of finding the time and the human and other resources to take on such an ambitious project. Further, even if they could repurpose the pound and create a research site, there would be a need for people to monitor it on a regular basis and to collect and analyze data. As we talked, we realized that maybe by bringing together the resources of the high school, Schoodic Institute, DMR, town shellfish committees, and DEI, we could make all of this happen. Below is a picture of Heidi, SMHS teacher Steve Belyea, and a student as they look over the future research site. Over the next weeks I will tell you about getting that work started. This entry was posted in Authentic Science in Schools, Schools and Scientists and tagged Authentic Learning, Citizen Science, science teaching, Sumner High School. Bookmark the permalink.